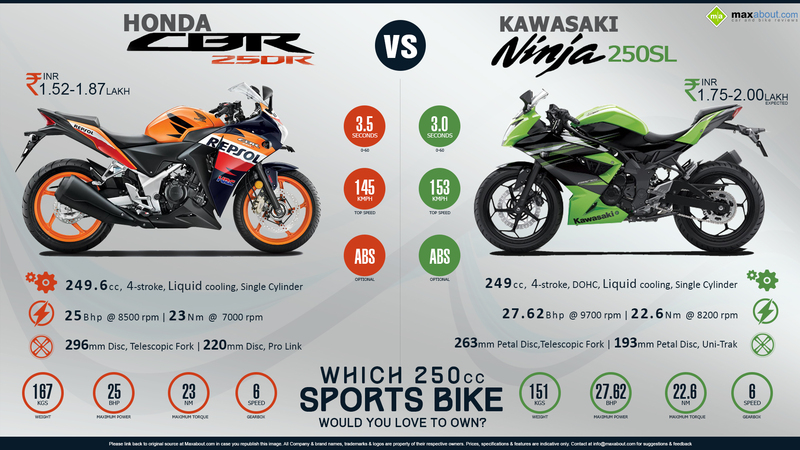 I seems on paper that the right choice is the Ninja 250SL. I feel like its important to give them a test drive to make sure; just looking at the numbers it looks close, but still clear that the Ninja is better. Great comparison between the two of these. It would be even better to see what performance is like throughout their RPM ranges to better see where each bike performs better than the other. it was a chart i go from Kawasaki's website, so it's as legit as they come. So on paper the Ninja 250 SL looks better. I think that one of the other things that will make a difference between the two is the pricing. Do we know which bike will cost more? Pricing on the Ninja over the CBR isn't too bad at all, close enough that pricing wouldn't put me off on buying the Ninja to settle for the CBR, which should be the case for many folks out there.